“Breath” from first time feature film director Simon Baker tells the coming-of-age story of two teenage boys searching for adventures in Western Australia with an entrancing film. Set in the 1970s, Sando (Simon Baker) takes under his wing young Loonie (Ben Spence) and Pikelet (Samson Coulter) and initiates them to surfing while encouraging them to take risks. He becomes a fatherly figure to the two boys and teaches them surfing on a more spiritual level. On the other side Sando’s partner Eva (Elizabeth Debicki) is a sensual figure to the boys. Debicki does a great job at portraying Eva. She appears distant and full of sorrow; she never feels fully present. The story focuses on Pikelet and his relationships with Sando, his best friend Loonie and Eva. 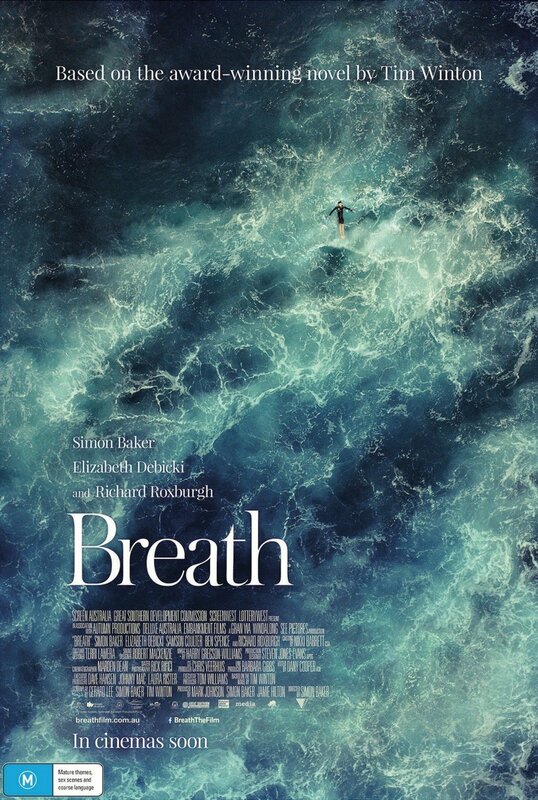 Like a lot of Australian movies, “Breath” displays vast outdoor landscapes and people’s relationship to nature. In the film the ocean appears to be an escape from everyday’s life that washes away your problems. In the water time seems to stop and the surfers make on with the waves. The film explores the complexity of growing up and discovering oneself, your strength and weaknesses and coming to term with them. A lot of the movie takes place in the ocean and with these scenes Baker takes us right along with them. We see the big waves, and we feel the nervousness of Pikelet as he summons the courage to ride them. Pikelet often appears to be panicking in the water before riding big waves. In one scene he becomes paralyzed by fear and stay in the boat observing his friend riding waves like he has nothing to loose. I understand what he felt at that moment. It happened to me once also while surfing. Panicking to the point where it paralyses you and you can’t move. Not fun. The cinematography is different from other surf movies. It doesn’t have the bright deep colors, it is more subtle; almost as if there was a layer of light fog. The film flows well, the scenes in the water are visually stunning and the music adds a feeling of calm and serenity. Baker succeeds in making a beautiful poetic feature without being pretentious about a boy exploring and discovering his abilities and navigating his tumultuous emotions. Side note: Ben Spence and Samson Coulter won the Best Actor Award at the Festival des Antipodes in Saint-Tropez.